Winter in Vegas and Gordon Biersch put out an amazing Winterbock. We all liked it so much we ate dinner there several weeks in a row, bought a growler full and refilled it. 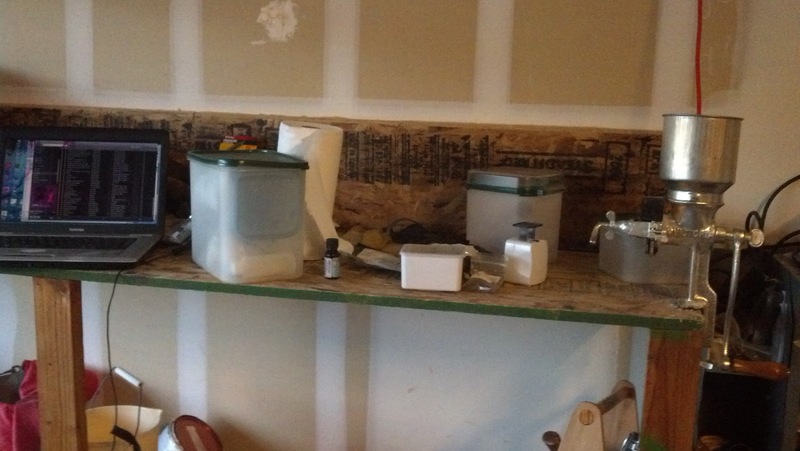 So when for Christmas, my brewery was upgraded to 5 gallon capacity - new grain mill, mash tun, lautering cooler, wort chiller, extra food bucket and a few odds and ends I picked up after, I knew what I had to do. Combine those two events together and I decided to make a dopplebock. Not sure I was thinking straight, because if I'd remembered the length of time and hassle it took to lager a Munich Dunkel last year, I might have thought better of it. 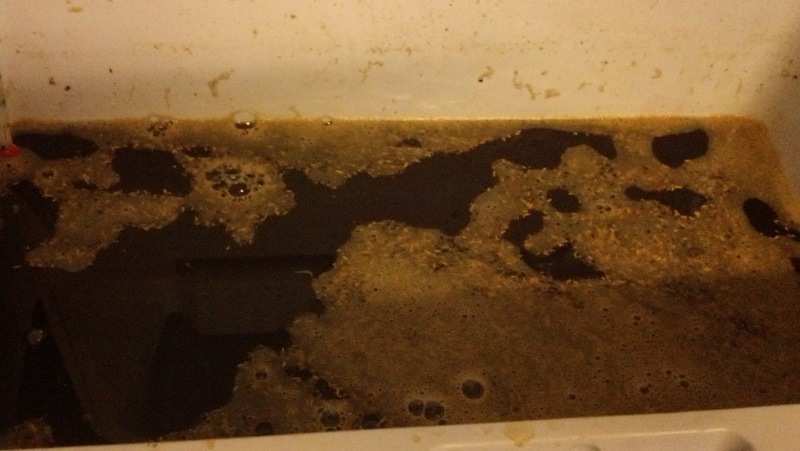 Did a bit of digging through beerrecipes.org, beersmithrecipes.com, Homebrew Favorites, "Designing Great Beers", and "Radical Brewing" and put together a powerful triple decoction brew with almost a 12% ABV. That's actually when I decided to build the cooler lautering tun. The mash tun just wouldn't hold enough grain and water to get up that high. 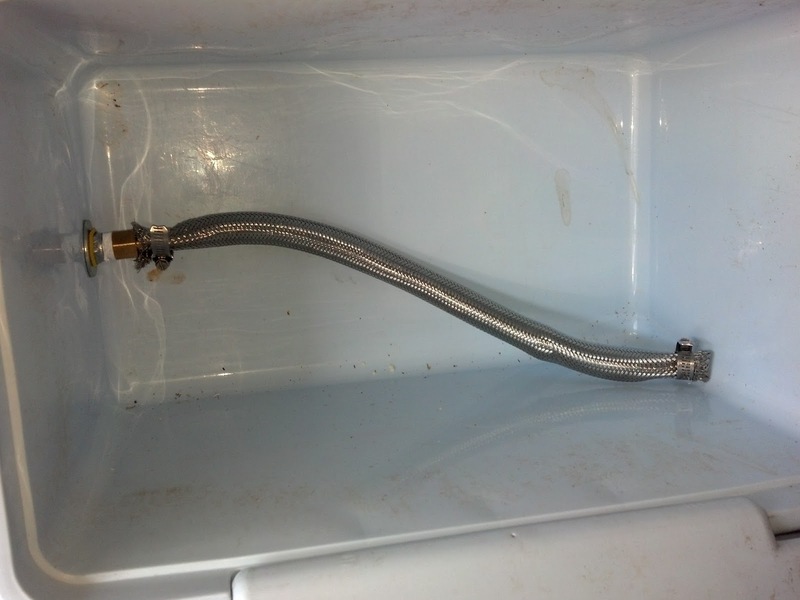 I used a braided hose for the filter in the bottom of the tun instead of the usual drilled PVC pipe solution. It ended up working very well. I was especially concerned because the mill I'd gotten (on the right below) was a Victoria instead of a roller mill and it tended to really pulverize some of the grain. Very slight difference between not cracking the grain and ending up with dust. I sanitized everything in the tub with bleach. A lot cheaper than Starsan and with a good rinsing, I've never had trouble with it. 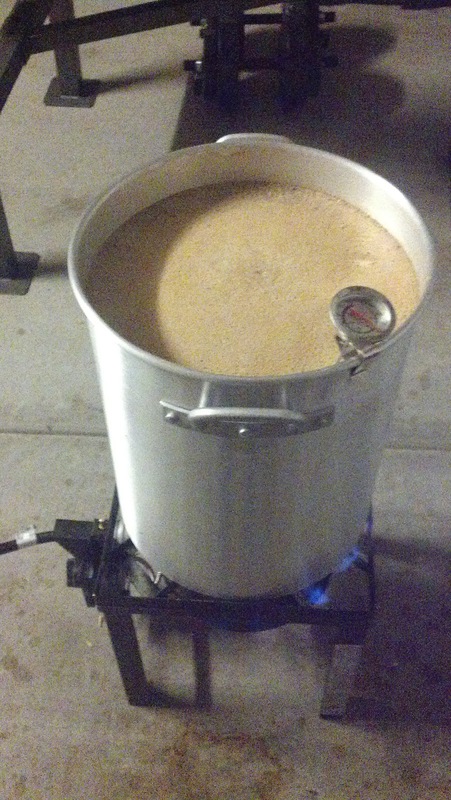 Did manage to pull my back out taking the mash tun out of the bathtub full of water to take out to the burner. Was fine the next day though. My whole grain bill came out to 16.5 pounds of grain - Amber malt, malted wheat, Briess malt, 2 kinds of crystal malt, chocolate malt, black patent malt, Vienna and Munich malts. Decoction is pretty tricky and depending on who you listen to, you can really go down a rat hole and waste a bunch of time. The first two decoctions I took, I actually ran the liquid and grain decoction through the remaining temperature rests, which took a couple hours a piece. By the time I added them back to the tun, the temperature in the tun had dropped about 10 degrees, so I ended up back where I started. 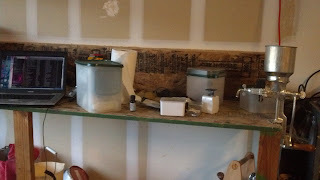 I then consulted a different source that said to just decoct the grains and boil them and add them back in. Then I started to make some progress and get the whole tun up to the right temperatures after three more decoctions. I spent the whole day doing this to finally get the tun up to the final temperatures. By then it was too late to do anything else, so it sat over night. It had an awesome smell with all those grains. This was also during a cold snap, so it was barely 30 degrees in the garage. Plus I had to keep the door partially open due to the propane burner running. The vodka I was using for minor sanitation jobs came in handy. The next day I started sparging...and sparging. 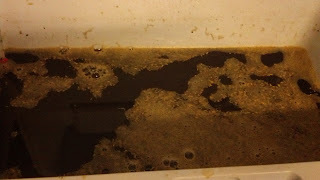 When I finished, the final gravity was 1.13 and there was plenty of color left in the runnings. I took another batch of sparge water and added it to the grains and let it soak really well, while I started the boil on the main batch. When I resparged the grains I ended up with another 5 gallons at a gravity of 1.03 and still a very good color. Later I added three pounds of Briess CBW Pure Malt Extract Non Diastatic Unhopped Traditional Dark LME to boost the gravity up. That was all I had of Hallertau, but I had a bunch of odds and ends of hops that would work out to about the same bitterness and aroma. Into the second running's boil, I threw Williamette 4.8% .55 oz, Kent goldings 5.7% .4oz, fuggles 4% .2 oz for bittering, and Centennial 8.7% .65 oz for aroma and for something a bit to my taste... half an ounce of anise. When it came to pitching, I'd followed Palmer's recommendation for creating the starter and pouring off the top portion and only pitching the bottom third. Seemed that both batches really took off slowly...well barely. But I am used to using glass jugs for primaries and not being able to see how the kreusen was developing was frustrating. I picked up another vial of yeast and the LME above. Created another starter with less DME and pitched the whole thing into the primary batch. The LME I put into the second batch not only to increase the gravity, but also to give the yeast something more substantial to dine upon. When I took the lids off both buckets, the kreusen was well developed in both, so I guess I needn't have worried. I pitched the yeast anyway and within a day, the airlock was really popping. The weather has really been cooperating and the garage has stayed right where I need it in the mid to high 50s. In a few weeks, I'm going to have to chill them down to the high 30s, so I'll be commandeering one of our refrigerators. Should be a good spring, as both of these should be ready, mid April. I think I will have to buy another bucket and brew up a quick stout so I don't die of thirst waiting. Well, lesson learned the hard way. Had to pitch the whole 5 gallons of dopplebock. The second runnings don't seem to be affected, although the anise could be hiding it. The dopplebock got infected and had totally gone sour. Pretty good chance it was from leaving it sit overnight after the mash or sparge. Either one could have done it. Next time - get it all done in one day.